Friday, July 6, 2012. I had different plans that afternoon, but car issues rescheduled my day and I ended up tagging along on my boyfriend’s day trip to Cape Cod. His family house in Orleans would be rented beginning the following day and through September, so this would be our last visit to the Cape until the fall. It also happened to be the last day on the Cape before the tourist season hit hardest; the crowding typically starts the week of July 4th and becomes overwhelming the following Saturday. Hoping to cram an entire summer into that one afternoon, I craved a quintessential Cape Cod meal: fresh fried clams at an old-fashioned clam shack. I was thinking that Cooke’s Seafood in Orleans, Massachusetts* would be the place for this. Cooke’s atmosphere is unimposing. You order and pay at the counter, receive a number, sit down, wave when the staff call your number, and then they bring the food to your table. There is indoor booth seating as well as an outdoor seating area underneath canvas. The interior decorating is mostly comprised of some nice oil paintings for sale by an Orleans artist named Stephen Roth. Although the restaurant was not especially crowded the two times I dined there, you should to take that with a grain of salt since I did not go during peak dining hours, let alone during tourist season. I have been told it gets very busy! I started with a cup of the clam chowder. Yes, I felt a little silly ordering hot soup on an 85-degree day, especially knowing that I would be following it up with more hot and heavy food. But hey, I like clam chowder, and these are the behaviors you have to expect from somebody who likes food so much that she writes a blog about it. I enjoyed the clam chowder. 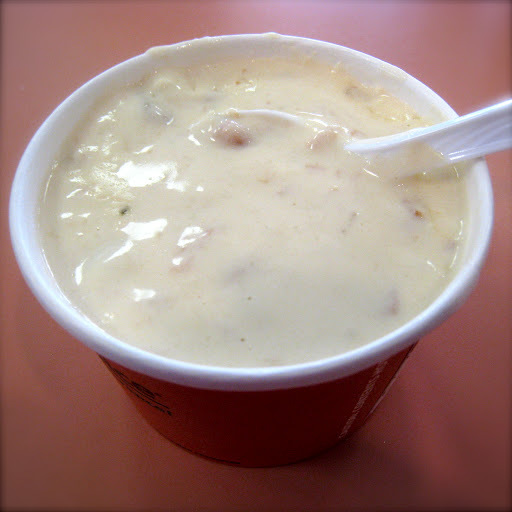 I didn’t think it was the best I had ever had, but this is more due to personal preference than quality: I like my clam chowder chunky. Cooke’s chowder was hot, thick, creamy, and flavorful, and if it were a cooler day outside I wouldn’t hesitate to order it again. For my entrée I ordered the whole clam platter: fresh, hot, and delicious. It came with french fries, coleslaw, and two onion rings. 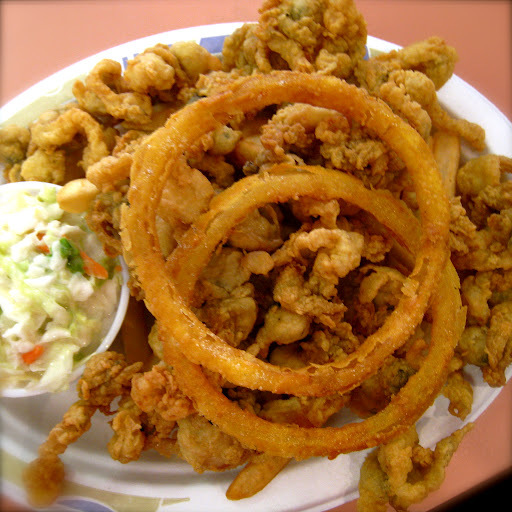 Fried clam platter with french fries, cole slaw, and onion rings. My boyfriend and I split the entrée platter. The portion was large enough for two people, especially on a hot Cape Cod summer day. To eat all of that on my own would have been too heavy. Prior to trying Cooke’s last summer, the only place I had ever eaten fried clams was Legal Sea Food. I liked Legal’s version so much that I ordered it just about every time I went there, and when I first went to Cooke’s I worried that I wouldn’t be able to enjoy fried clams at Cooke’s because I was accustomed to how clams were fried at Legal. But after one bite of Cooke’s, I realized that there was no need to worry. It was different and still delicious! Inside the restaurant a stuffed toy lobster holds a sign advertising the “best lobster rolls on the Cape,” citing the Boston Globe food section. My curiosity was piqued, and after some Google searching I found the Boston Globe article in question, but only an archived portion. 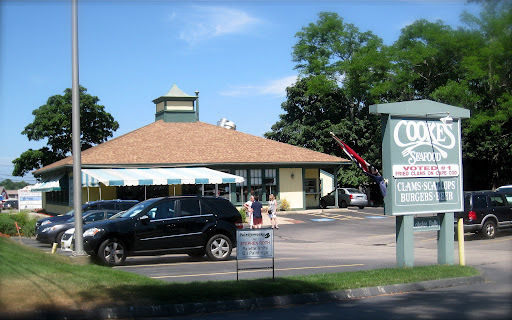 I did, however, find other reviews praising Cooke’s lobster rolls, as well as an old Boston Globe lobster roll recipe adapted from Cooke’s Seafood. I skimmed some of Cooke’s other web reviews (Zagat, Yelp, UrbanSpoon) while drafting this post. I was genuinely surprised at the variation. Some people loved it, some felt so-so, some didn’t like it at all. There were multiple cries of “tourist trap!”. 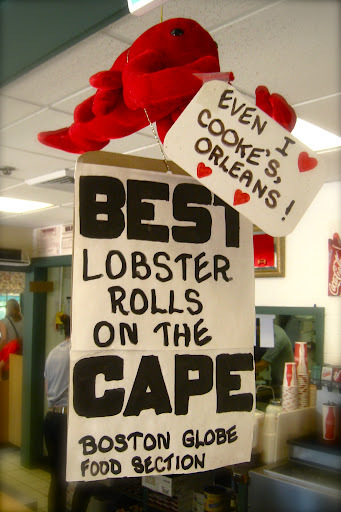 Maybe I’m biased—as I said above, my boyfriend introduced to me to Cooke’s and he’s a foodie who knows the Cape food scene very well—but I didn’t find it to be a tourist trap at all. There is an extent to which every travel-destination eatery that attracts long, tourist-filled lines will inevitably be declared a “tourist trap,” but that description applies to almost every eatery on the Cape during the summer, especially the good ones. Some reviewers felt that Cooke’s food was overpriced. I disagree. Paying $23.99 for a platter might not be “cheap” compared to what you would pay for a burger, but it’s about what I expect to pay for a sizable portion of fresh fried clams at any restaurant. Besides, it’s hard enough for most restaurants to turn a profit by relying on alcohol for their margins. Imagine the difficulty when you don’t have that padding. All things considered, I think $23.99 for these clams is a fair price for a fair profit. Cooke’s Seafood is not trying to be to be a sit-down restaurant like Legal Sea Foods or an upscale dining room like Le Bernardin, nor should it be. It is fantastic for what it is, a seasonal clam shack. I’ve had good experiences there and look forward to going again. Next time I will probably try the lobster roll. I vastly prefer Connecticut-style (hot with butter) over Maine-style (cold with mayonnaise), but if Cooke’s is known for their Maine-style lobster rolls, then I feel it’s worth a shot!